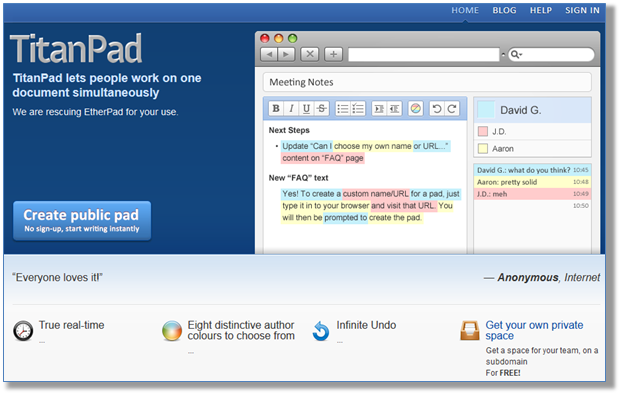 TitanPad is a free simple tool that facilitates people to work on a document simultaneously online without the need for account creation. TitanPad allows you to easily create a new document or private space that can be shared using the unique url, once the person clicks your link they enter their name and can begin writing. Additions and edits to the document are made in real time and to make it easy to identify track changes each collaborator is allocated a different colour. Changes to your document are automatically saved however you also given the option to save changes whenever you like as well as having the option to revert to previous versions of the document if necessary. 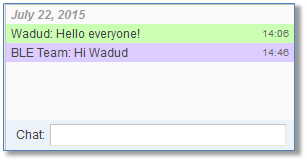 There is a simple chat feature that allows group members to communicate with other fellow collaborators. Please note that documents can only edited by those who have the unique link therefore to keep the working document private share those involved in the collaboration. If you want to enforce security of your document then it is recommended that you create an account to obtain your own private space. Depending on the activity of each ‘pad’ there is an automatic deletion after two weeks from when it was last accessed or when an amendment was made. 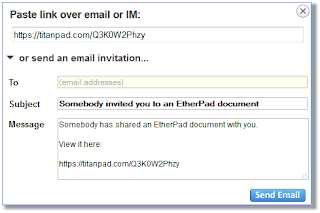 The URL address is unique to your pad which you can share with fellow collaborators. Insert your name and change the colour if necessary as you are automatically assigned. Documents can be created from scratch or by using the Import feature which allows you to extract text from HTML, word or RTF files. Whilst the export feature allows the finalised document to be downloaded in the form of html, bookmark file, as an open document, plain text, PDF or word file. Although TitanPad saves automatically you can also create save points, which is useful if you make a major revision that you can revert back to if you change your mind at a later date. In the example below I can see there are two major edits with the ability to view the edit, restore before the edit or accept the changes by clicking the Save now button. One of the features that caught my eye was the time slider which allows you to view past document revisions in the order that they occurred. You can either ‘play’ the slider to view the additions/edits as they took place in the document or you can manually move the timeline to specific points. Save now points are highlighted on the slider as yellow stars. As well as viewing the changes you can move the slider to a specific point and download the document at that specific version. TitanPad offers a quick and easy to work collaboratively on a document without the need to create accounts thus saving time from any registration process usually associated with most online tools. It is a tool that can facilitate online brainstorming sessions with multiple members that collaborate together as a group in real ideal making it ideal for students carrying out group work.